It takes single point responsibility in executing the project from Concept to Commissioning. With efficient project parenting skills, this division is actively growing and searching for newer areas to venture into. The division is strengthened by in House manufacturing of Pumps, Motors, HT Panels, LT Panels, and Current & Potential Transformers with a Dedicated Supply Chain. Strategic Tie up with World renowned Companies for the Latest Technology and Products. It has commissioned Pumping Station Projects with single Unit up to 13 MW and Switchyards from 11 KV to 110 KV for Pumping & Hydro Projects. The company has till date commissioned more than 100 irrigation and Power Projects to complete satisfaction of Clients. Engineered Pumps & Projects Division is segregated into two groups to ensure a dedicated approach. Jyoti has wide presence in Power Sector and has carried out various pumping projects across the country. Jyoti has supplied more than 180 nos. of CW pumps for Thermal & Nuclear Power Projects. CW pumps under execution. 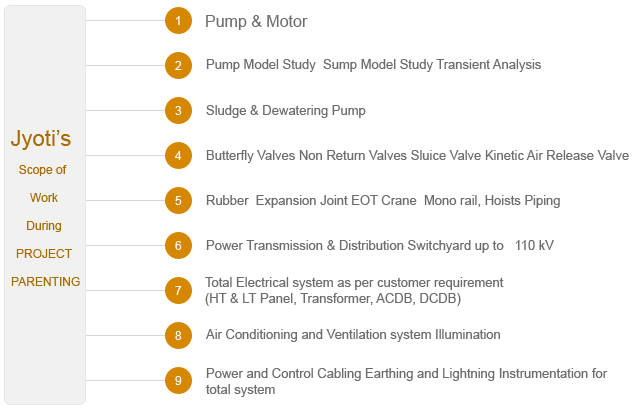 Type of projects carried out by Power Group. Jyoti is widely accepted and recognized as leading company for Lift Irrigation and Water supply schemes. Jyoti has recorded supplies of pumps from 50KW to 13 MW motor ratings to all major Govt. bodies across India.